Mini Split Heat and Air Conditioning – Morrison Inc.
A comfortable home is a happy home. That’s why thousands of families choose Fujitsu General Halcyon™ Ductless Mini-Split Systems for whisper-quiet, energy-efficient heating and cooling for their new or existing homes. These sleek units require no ductwork and allow for flexible, room-by-room temperature control. And with available utility rebates, the savings start on day one. Mini-split heat pumps are not only great solutions for whole home or new constructions but make good retrofit add-ons to houses with “non-ducted” heating systems, such as hydronic (hot water heat), radiant panels, and space heaters (wood, kerosene, propane). They can also be a good choice for room additions where extending or installing distribution ductwork is not feasible, and energy efficient new homes that require only a small space conditioning system. 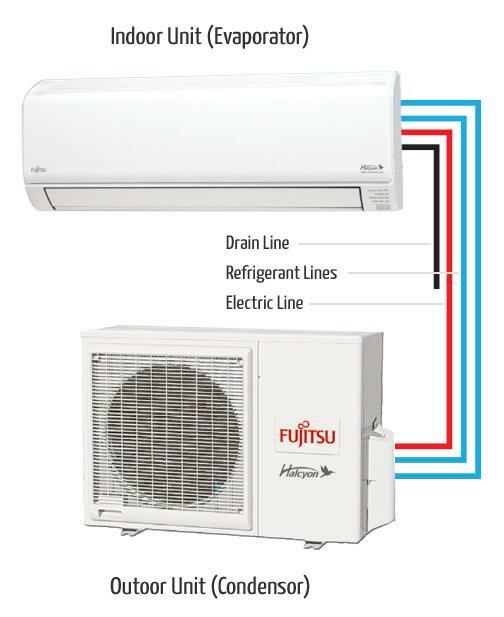 Fujitsu heating and cooling mini-split systems provide excellent individual room temperature. Styles available to match any space or application. Choose from a variety of ceiling and wall mounted units. Contact us for more information on the Fijitsu Mini-Split Heating and Cooling Systems.